My first original novels, both released in the UK and US by Angry Robot Books. I wanted to take the old chestnut that is the fantasy 'epic journey' novel and set it inside a house. Because my head's wired up wrong. It's difficult to convey the massive deal these books were (and still are) for me. As much as I had enjoyed writing the several tie-in novels that preceded them, the chance to create something totally original was a dream come true. That's not to say the writing of them was easy, of course, especially the climax of RESTORATION which was originally written while suffering from concussion. Thankfully I was later able to go back to it and turn the delirious nonsense into something that makes sense. 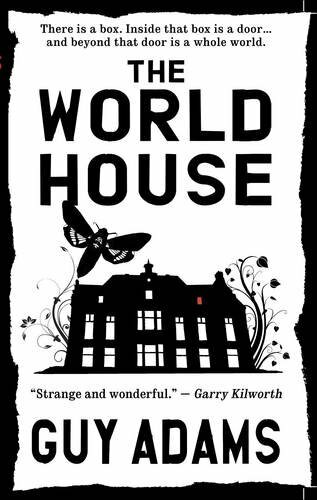 On the subject of sense: RESTORATION doesn't make any if you haven't read THE WORLD HOUSE. One reviewer gamely tried and found himself weeping in confusion thirty pages in. 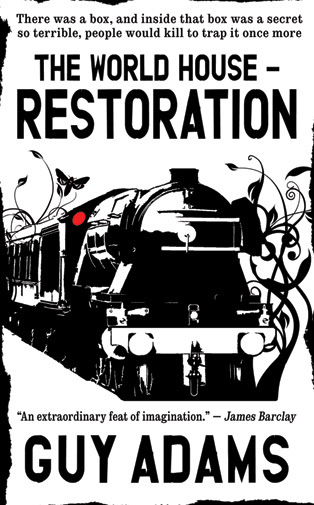 It's not so much that it's one big novel split over two books, the two novels are very different, but RESTORATION is a direct response to the events of THE WORLD HOUSE and you really need to know what happened there to stand a chance of keeping up. And at the very top of the house, a prisoner sits behind a locked door waiting for a key to turn. The day that happens, the world will end. tumbling box of delights full of adorable eccentrics on a wild, wild ride. It really knocked me in the lobes! Great fun!" "Strange and wonderful The World House will take you on a long bizarre journey within four walls, carrying you into dark imaginative regions from room to room, basement to attic, and leave you with the feeling that a journey to the centre of the earth, or to the moon, would be no less exhilarating." "The World House is an extraordinary feat of imagination. It is wonderfully bizarre, it is brutal, funny, disturbing and vivid throughout. It is populated by a genuinely entertaining and believable group of characters. Guy Adams has a hit on his hands. I want more." "The World House scintillates with wild ideas, snappy dialogue and larger-than-life characters. It is an audacious, joyous roller-coaster of a book, and yet what makes it such a triumph is that even in its wildest excesses it never loses sight of the little people. Ostensibly a tale of human endeavour, perseverance and a determination to fight on despite overwhelming odds, The World House is a novel with lashings of heart and soul." "Guy Adams is either barking mad or a genius, I haven't decided. His truly fantastic debut is like being caught in a theme park with a killer clown - fun, adventure, the odd cream pie - and a sharp knife when you're not looking." "This is an unconventional book that strays far into the realm of fantasy and leaves readers without a compass for a while, like the hapless sailors in the bathroom sea of the later chapters. So far though the story holds together soundly. This bodes well for the next instalment of the series, Restoration. "It's violent, and the violence is a key part of the scenery… it's clever and original and inventive and a good read for all that." "But in the meantime we have The World House, which is a wonderful read - and a book that deserves to be in the best-seller lists - by a writer who will at least keep me reading his new fiction." "This is the kind of book that 'Best of Lists' were made for. Nine and Three Quarters out of Ten"
"The World House is a utterly original, quite craz y and simply brilliant piece of fiction. 5*****"
"if you enjoy strange and bizarre tales and especially if you love Neil Gaiman's work and wonder what his tales would be like on a bad trip, get yourself a copy of The World House"
"a brilliant twisted fantasy that's dark and bewildering and somewhat funny as well… it's like alice in wonderland meets steven king on mescaline"
"the exploration of the house by the characters is the highlight of the book, with each group finding more bizarre rooms, each with an imaginative set-up"
They sought the box for many years, because held inside that arcane magical artefact was, miraculously, a house. But now its real purpose has become clear - it was a prison, and the infinitely evil being it was built to imprison has been let loose. Now the real quest begins in earnest.